Harlem has changed dramatically from the 1920s when large numbers of African Americans began moving there. However, the last 10 years have seen swift changes to the economic and ethnic makeup of this historic community . In order to gain some perspective we took a look at historical photographs of buildings in Harlem and compared them to the structures as they stand today or the buildings that replaced them. This was the site of Temple No. 7 of the Nation of Islam at the corner 116th Street and Malcolm X Boulevard but the building was firebombed in 1965 following the assassination of Malcolm X. 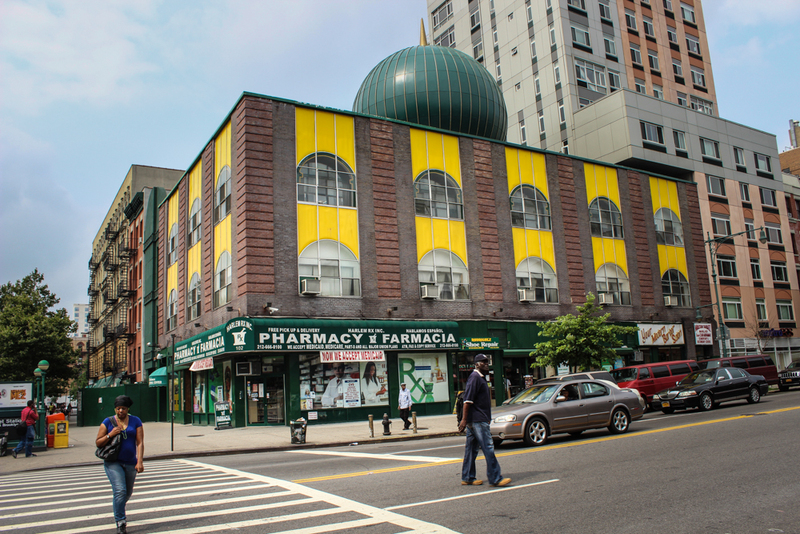 The structure was rebuilt and renamed Malcolm Shabazz Mosque in honor of Malcolm X and has no affiliation with the Nation of Islam. 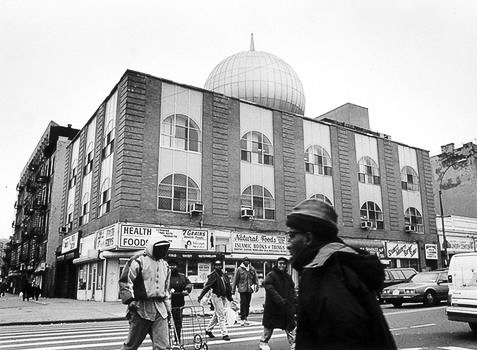 This 1993 photo by photographer Edward Gradza appears in the book NY Masjid: The Mosques of New York published by PowerHouse Books. Below it you will find a photo of the building as it stands in 2013. The Hotel Teresa was built in 1913 by Gustavus Sidenberg, a German-born stockbroker, who named it after his wife. 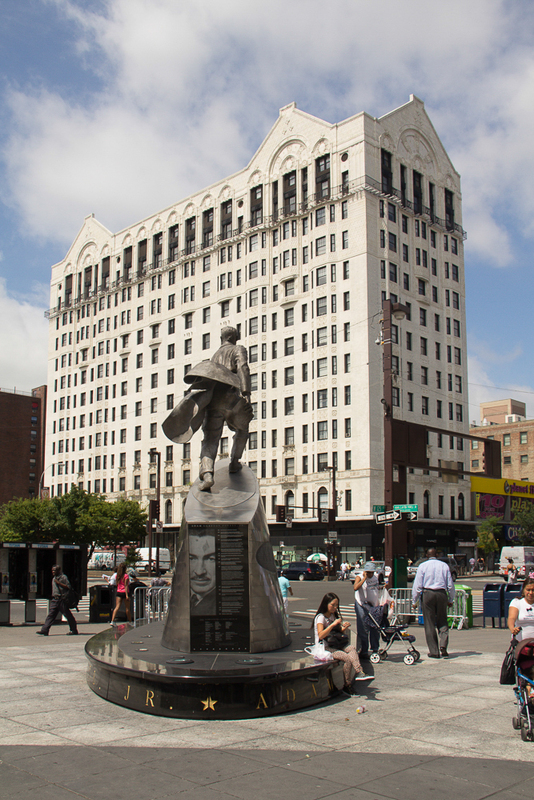 The 13-story, 300-room hotel is located on Adam Clayton Powell, Jr. Boulevard between 124th and 125th Streets. It was built with a distinctive terra-cotta facade, designed by George and Edward Blum, that made it stand out against the skyline of northern Manhattan. The hotel originally opened wIth an all-white staff and only served white patrons. As more blacks moved to Harlem from the south and the Caribbean the hotel converted to an all-black staff and began to serve all races by 1940. It was called "the Waldorf of Harlem" and during the 1940s and 1950s it became the center of African-American life. In 1948 Joe Louis made the hotel his victory headquarters. After his win over Jersey Joe Walcott at the Polo Grounds the hotel was surrounded by 10,000 fans. It made international headlines when Cuba's Fidel Castro moved to the hotel in 1960 after a dispute with the management of the Hotel Shelburne at 37th and Lexington. The Hotel Teresa also provided office space for important civil rights organizations. Malcolm X's Organization of Afro-American Unity had offices at the hotel. Bayard Rustin and A. Phillip Randolph held planning sessions there for the 1963 March on Washington. The hotel was sold in 1966 for $1.25 million dollars and by 1970 all of the hotel rooms were converted to offices and the building became the Teresa Towers. Today's photo below is was taken from diagonally across 125th Street on the grounds of the Adam Clayton Powell, Jr. State Office building with Congressman Powell's statue in the foreground. This 1939 photo was taken at the corner of Frederick Douglass Boulevard and 125th Street by documentary photographer Sid Grossman. It shows the steel column supporting the elevated 8th Avenue Subway, Borden's Milk store, a New York City bus and a partial view of 125th Street. Today's photo below shows that the building is now owned by the United House of Prayer and Capital One Bank has replaced Borden's Milk. The 8th Avenue elevated subway tracks have been replaced by underground rails. Renaissance Ballroom and Casino was completed in 1924 and was owned by black businessmen. 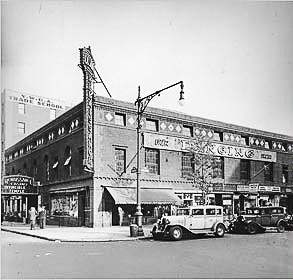 The "Rennie" housed a ballroom, casino and a 900-seat theater that hosted prize fights, dances, social gatherings, concerts, films, stage acts and was home to a professional basketball team, the Harlem Renaissance. It was renowned for its big bands and hosted most of the major jazz musicians of 1930s and 1940s including Fletcher Henderson, Duke Ellington, Benny Carter, Count Basie and Ella Fitzgerald. Today's photo below shows the crumbling facade of the ballroom. 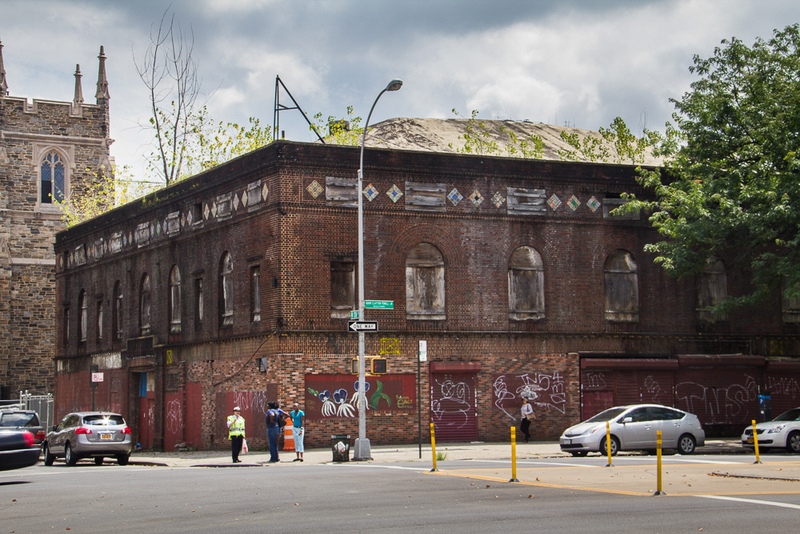 The property was purchased in 1991 by the Abyssinian Development Corporation and plans are underway to redevelop the site.